Apartment Kerschbaumer: Comfort and best facilities in a dream location, centrally located in the World Heritage town of Hallstatt, directly on the lake, with stunning lake views; just a few minutes’ walk to all World Heritage attractions, just over an hour from Salzburg. Cosy, comfortable, well equipped, central and with direct lake view. You enter the house directly from the “Seestraße” via one of Hallstatt's typical staircases. The cosy, comfortably furnished apartment can accommodate 2 to 4 people in two spacious rooms. One of the bedrooms has separate beds. The rooms open onto the balcony, which offers stunning views of the lake, mountains and historic Hallstatt. 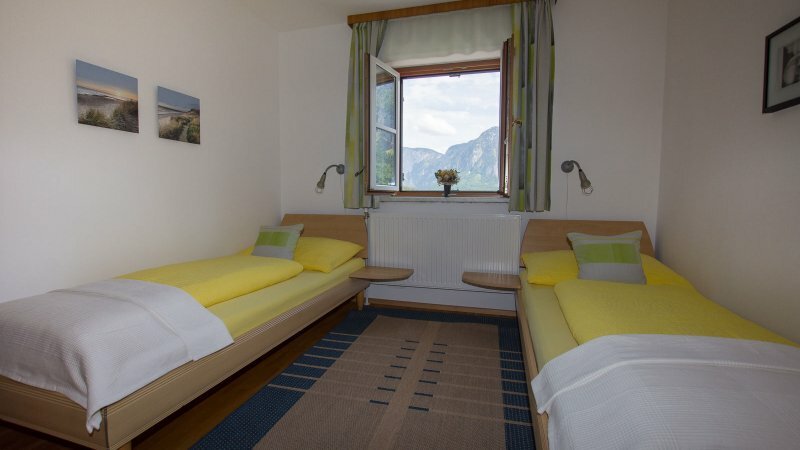 The apartment also includes a spacious kitchen diner with a cosy seating area and direct views of Lake Hallstatt. Stove with oven, refrigerator with freezer, microwave, coffee maker, toaster, kettle, dishwasher and cooking and eating utensils are all available. 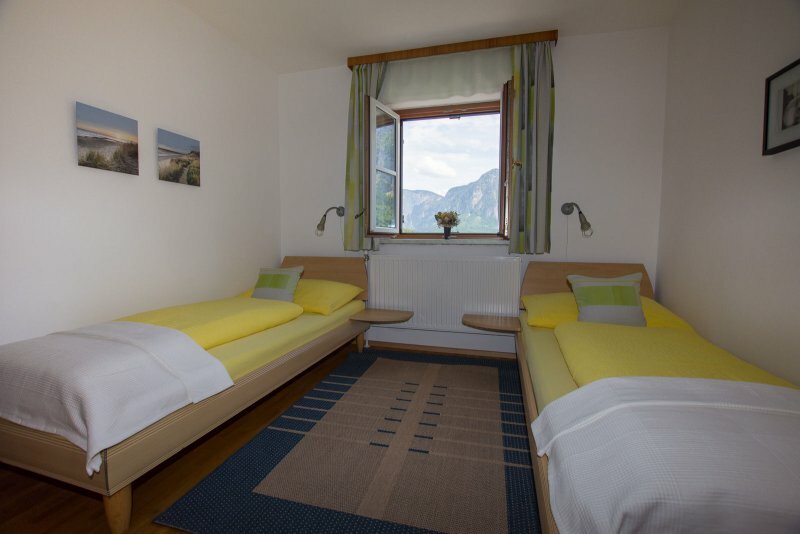 Experience Hallstatt from the front row: The cosy and comfortable apartment for up to 4 people is located directly in the historic UNESCO World Heritage town of Hallstatt - directly on the lake in a fantastic panoramic position. From the balcony you can enjoy a wonderful view of Lake Hallstatt, the surrounding mountains, the world-famous town with the houses daringly built into the rock face. The valley station of the Hallstatt Salzberg cable car, which takes you up to the Rudolfsturm with its lookout bridge and the "Skywalk" viewing platform floating above the abyss, from which you can enjoy the "World Heritage View" of Hallstatt, over Lake Hallstatt and onto the mountains of the Dachstein Massif. The show mine of the Salzwelten Hallstatt, reachable from the mountain station of the Salzberg cable car in a few minutes. Here you will experience a fascinating tour through underground mountain worlds, tunnels and caverns. Mountain experience Dachstein-Krippenstein: Just a few minutes by car to the valley station of the Dachstein-Krippenstein cable car in Obertraun. The panoramic cable car takes you up to the entrances of the Dachstein's impressive cave systems, the world-famous Dachstein Ice Cave and the huge Mammoth Cave. Just a few steps from the mountain station you can enjoy a wonderful panoramic view (World Natural Heritage view) over and the Dachstein plateau and the peaks of the Dachstein massif. After a short walk you reach the spectacular viewing platform "5fingers", from which you can enjoy a breath-taking view of Lake Hallstatt and the Salzkammergut with its wild mountain landscape, floating above the abyss. Sport in the Salzkammergut: The Salzkammergut with its valleys, mountains and lakes also invites you to wonderful cycling and mountain biking adventures as well as hikes and climbing tours and offers numerous opportunities for skiing and snowboarding experiences in winter. The scenically impressive "Freesports Arena Dachstein-Krippenstein" enjoys great popularity with both on & off piste lovers and freeriders. Imperial City of Bad Ischl: In just under 30 minutes from Hallstatt you can reach the imperial city of Bad Ischl with its historic city centre, the Imperial Villa, the world-famous Zauner pastry shop and the salt thermal spa. The "Weiße Rössl am Wolfgangsee“ (White horse Inn): In less than 45 minutes from Hallstatt you can reach St. Wolfgang on the idyllic Lake Wolfgang. Directly on the lake stands the famous hotel "Weißes Rössl” (White Horse). Here is where the composer Ralph Benatzky set his musical comedy "Im weißen Rössl”. The hotel also served as a backdrop for numerous feature films. From St. Wolfgang, the 5.85-kilometer-long “Schafbergbahn”, a cogwheel railway, takes you up to the 1782 meter high Schafberg. From here you can enjoy a wonderful panoramic view of the Salzkammergut lakes Lake Wolfgangsee, Attersee, Mondsee and Fuschlsee. Mozart City Salzburg: And in just over an hour you can reach Salzburg, the birthplace of the great Austrian composer Wolfgang Amadeus Mozart, the "City of Mozart". Getreidegasse, Mozart's birthplace, cathedral, Residenzplatz, Hohensalzburg, the castles of Mirabell and Hellbrunn, Festspielhaus - just a few of the many world-famous sights. Year after year, the Salzburg Festival captivates many thousands of music fans from all over the world. Particularly popular are the annual performances of the "Everyman" on the cathedral square. Steel and cultural city of Linz: Also Linz "Steel City", a cultural metropolis and Upper Austrian capital on the Danube with Lentos, Brucknerhaus and Ars Electronica Centre, is less than two hours from Hallstatt. 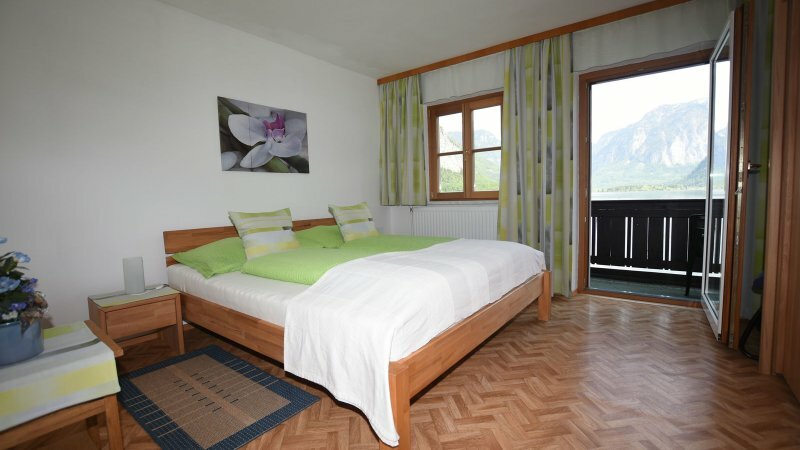 Wonderful excursions, fascinating landscapes, world-famous sights, down-to-earth people, variety and relaxation in sports and exercise, cultural and culinary highlights – you can experience all this in summer and winter from our apartment in the middle of the World Heritage town of Hallstatt. Stay of 3 nights and longer 60.- Euro per person and night. Check-in/out, as well as luggage storage is individually possible after consultation. Send booking inquiry for Holiday apartment Kerschbaumer now!